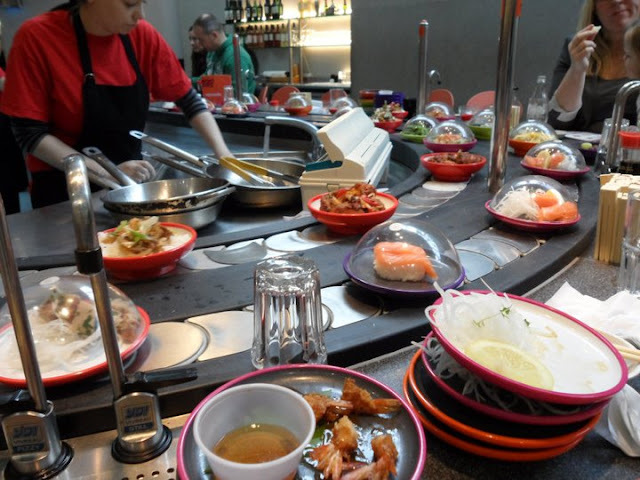 I have been to yo!sushi for few times but I got the same feeling every time after eating it, THE FOOD IS DISGUSTING. I thought I would give it another chance since it has 40% off at the moment but it disappointed me again. This is the most terrible sushi place ever, the staffs prepared food without gloves on, one of the staff mix the seaweed with his BARE hand, this was disgust me, it's ok if their hands were clean but I just saw them cleaning tables then touch the food again without washing their hands. Me and my friend felt like puking after seeing them prepare the food. This place is seriously poor and greedy, it's price over quality, sushi is long prepared, not fresh, the maki pieces are very small and not fresh at all... Cheap soya, old wasabi which is on the table in a pot. People who say this place has good food probably don't know the quality of freshly prepared well made sushi.